This review course intends to ensure that all Airtasker Support members are fully aware of the golden rules which we all must observe while attending to each ticket case. By now, you should have finished the Knowledge Check. On the succeeding pages, the same scenario tests have been laid out with self-corrections. If you are able to select the correct answer, give yourself a pat, you are doing the golden things on your ticketing. However, if you have selected a wrong answer, don't feel too bad -- this is why we have this review course to rectify the grey areas for you as early as now. If you have selected an incorrect answer, there will be a pop-up explanation until you get to the correct response. When you have completed the scenario tests, you will be asked to complete a sign-off of your full understanding as well as your feedback of this learning material. If you have any question, feel free to approach your QA Specialist or Trainer. At Airtasker, it is necessary to meet and exceed the expectations of our members and doing the right things right every time will ensure positive Airtasker experience across the platform, the critical quality attributes is at the forefront of which. We are not supposed to give out any private information of our members to anyone, even to them without being 100% sure that they are who they say they are. Poster Andrea has contacted us saying that the task wasn't completed to requirements by Worker Removalist B, when you searched through zendesk, you have come across a new ticket from the Worker. However, you have accidentally merged the Poster's ticket to that of the Worker's. What should you do now? A. Never mind the Poster's closed ticket due to merging and just respond to Worker's query on the merged into ticket. B. Close off the merged into ticket, and take no further action. C. Close off the merged into ticket, and create 2 new tickets to respond to both separately and remember to put a tag “outbound” onto the new tickets. Link to the original tickets. D. Respond to the closed due to merging ticket through a new outbound ticket and respond to the other query on the merged into ticket. A Poster has contacted us to verify their credit card details we have on our database, how will your response look like? 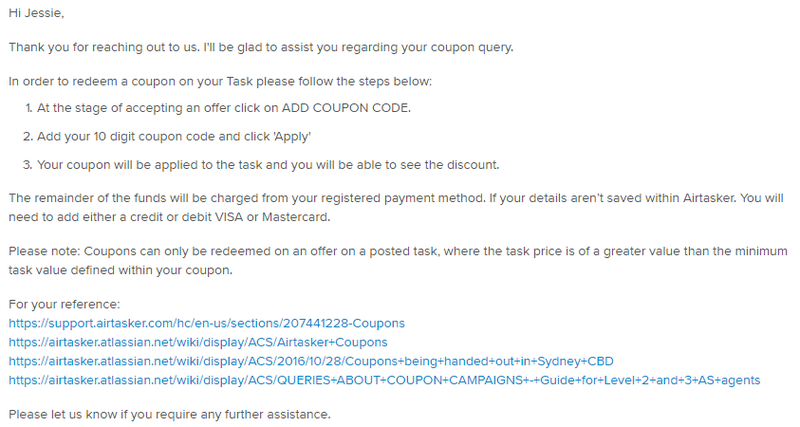 "Hi Airtasker, I have been trying to check if you have my correct credit card details as I will be assigning a Task soon. Can you email me back my full 16-digit credit card number, cvv and expiration date? Appreciate your quick reply. I am getting frustrated now as I can not figure out if you have the correct numbers, otherwise I think I am just going to close my account." Hi Member, unfortunately we are unable to provide assistance to suspicious requests. Hi Member, yes definitely we can help you with that. You have put in 5111-1111-1111-1111 Mastercard as your payment method with expiration date 12/2020. Unfortunately we do not have the cvv on records but we hope that helps you with the query in the meantime. We look forward to seeing you assign a Worker to your Task now. 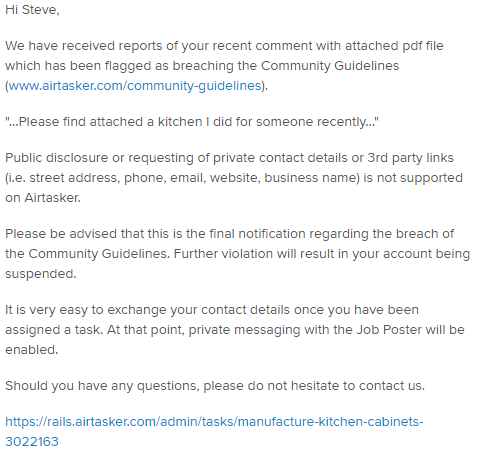 Hi Member, for privacy and security we are unable to provide you with the requested information but you should be able to look that up from your end through this link: https://www.airtasker.com/account/payments/. You may opt to re-enter your credit card details to ensure they are correct. Which of the following will you escalate to Sydney to have the email content redacted? A. Unable to add card, Poster provided the full 16 digits of the credit card for us to check for them. A member is reaching out as they forgot the password they have nominated for the account, you have noticed that they have contacted Airtasker using a non-registered email address. What should be your response? A User has contacted us using a “similar” email address, ie a typo error or different domain, how would your response look like? 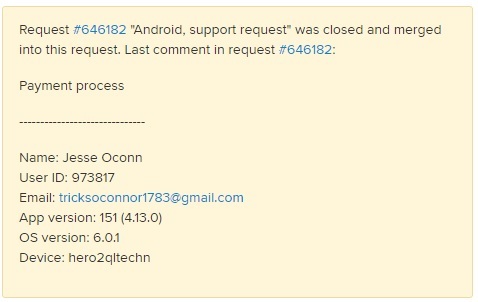 A Worker is following up on a payment, but upon checking there is no completed tasks yet when email address used to contact us is searched in rails, but you noticed that on the payment methods tab, there is another User ID that shares the same banking information and confirms it is a duplicate account where the task is linked to. What actions will you perform to resolve the issue? 1. Reply to the Worker and explain that we have noticed he may have a duplicate account and that we will need to ID check him. Provide generic guidance about the enquiry where necessary. 5. Un-restrict the account to be retained, put admin notes and assist with account or task specific question. We must adhere to company confidentiality at all times, including not sharing the tools we are using, as well as keeping the office and its member's info private. A member is so thankful he has now received all the payment for his 20 completed tasks and would like to personally thank the agent who has assisted him. The Worker would like to know the mobile number of the agent or at the very least their work email address, as they would like to send a special gift to the Airsupport member, what will response's content be? A. Politely decline giving out the info of your co-agent to protect their privacy but let the Worker know that we will relay their appreciation to the concerned agent, and also assure that them that all agents are at their service. B. Unfortunately we are unable to give out the mobile number and email address of our agent but if the Worker insists to give a gift, you can share the office address. C. No need to reply to the email, close off as nfar. 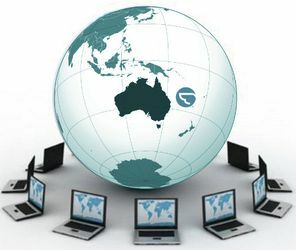 Member would only like to talk to an Australian-based agent and in asking what your office location is. How would you respond to the ticket? C. Hi there, I understand your frustration and will escalate your concern to a Sydney-based Team member now.